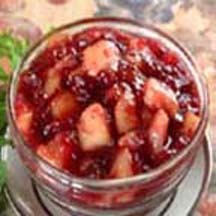 This quick, two-ingredient fruit relish takes just a couple of minutes to stir up, yet is special enough to serve for any occasion. Place apples in food processor or blender; cover. Process until coarsely chopped. Combine apples and cranberry sauce in medium bowl; cover. Refrigerate for at least 1 hour.